The fifth Challenge of the 2018 Challenge series is a 3 day challenge to celebrate the Solar Eclipse on August 11th. The challenge is being offered on the Proth Prime Search (LLR) Project. A solar eclipse occurs when the disk of the moon appears to cross in front of the disk of the sun. A total solar eclipse — like the one that took place on Aug. 21, 2017 — occurs when the disk of the moon blocks 100 percent of the solar disk. A partial eclipse occurs when the moon covers only part of the sun. The Aug. 11, 2018 partial solar eclipse will touch many countries in the Northern Hemisphere. This animation shows the path of the moon's shadow. The eclipse will start out over the North Atlantic Ocean and Greenland, moving north and east so that the shadow simultaneously moves toward Iceland, northern Europe and the northern polar regions. Continuing its path over the top of the planet, the shadow will be wide enough to cover most of northern Russia from east to west. It will then dip down into Mongolia, China and surrounding areas. It will officially begin when the moon first appears to make contact with the sun's disk at 4:02 a.m. EDT (0802 UTC). Maximum eclipse will happen at 5:46 a.m. EDT (0946 UTC), when the eclipse is at magnitude 0.7361. To participate in the Challenge, please select only the Proth Prime Search LLR (PPS) project in your PrimeGrid preferences section. The challenge will begin 10th August 2018 18:00 UTC and end 13th August 2018 18:00 UTC. Note that PPSE and PPS Mega do not count towards this challenge. Highly overclocked Haswell, Broadwell, Skylake, Kaby Lake or Coffee Lake (i.e., Intel Core i7, i5, and i3 -4xxx or better) computers running the application will see fastest times. Note that SR5 is running the latest FMA3 version of LLR which takes full advantage of the features of these newer CPUs. It's faster than the previous LLR app and draws more power and produces more heat. If you have a Haswell, Broadwell, Skylake, Kaby Lake or Coffee Lake CPU, especially if it's overclocked or has overclocked memory, and haven't run the new FMA3 LLR before, we strongly suggest running it before the challenge while you are monitoring the temperatures. Scores will be kept for individuals and teams. Only tasks issued AFTER 10th August 2018 18:00 UTC and received BEFORE 13th August 2018 18:00 UTC will be considered for credit. We will be using the same scoring method as we currently use for BOINC credits. A quorum of 2 is NOT needed to award Challenge score - i.e. no double checker. Therefore, each returned result will earn a Challenge score. Please note that if the result is eventually declared invalid, the score will be removed. The Proth Prime Search is done in collaboration with the Proth Search project. This search looks for primes in the form k*2^n+1. With the condition 2^n > k, these are often called Proth primes. This project also has the added bonus of possibly finding factors of "classical" Fermat numbers or Generalized Fermat numbers. As this requires PrimeFormGW (PFGW) (a primality-testing program), once PrimeGrid finds a prime, it is then tested on PrimeGrid's servers for divisibility. Proth Search only searches for k<1200. PrimeGrid created an extension to that which includes all candidates 1200<k<10000 for n<5M. It is this extension which we call PPSE. Initially, PrimeGrid's PPS project's goal was to double check all previous work up to n=500K for odd k<1200 and to fill in any gaps that were missed. We have accomplished that now and have increased it to n=3M. PG's LLRNet searched up to n=200,000 and found several missed primes in previously searched ranges. Although primes that small did not make it into the Top 5000 Primes database, the work was still important as it may have led to new factors for "classical" Fermat numbers or Generalized Fermat numbers. While there are many GFN factors, currently there are only 297 "classical" Fermat number factors known. Current primes found in PPS definitely make it into the Top 5000 Primes database. Early in 2008, PrimeGrid and Proth Search teamed up to provide a software managed distributed effort to the search. Although it might appear that PrimeGrid is duplicating some of the Proth Search effort by re-doing some ranges, few ranges on Proth Search were ever double-checked. This has resulted in PrimeGrid finding primes that were missed by previous searchers. By the end of 2008, all new primes found by PrimeGrid were eligible for inclusion in Chris Caldwell's Prime Pages Top 5000. Sometime in 2009, over 90% of the tests handed out by PrimeGrid were numbers that had never been tested. Message 119615 - Posted: 26 Jul 2018 | 15:46:54 UTC - in response to Message 119497. Message 119616 - Posted: 26 Jul 2018 | 18:12:53 UTC - in response to Message 119615. So a couple days ago I decided to switch to PPS LLR in preparation for the challenge. 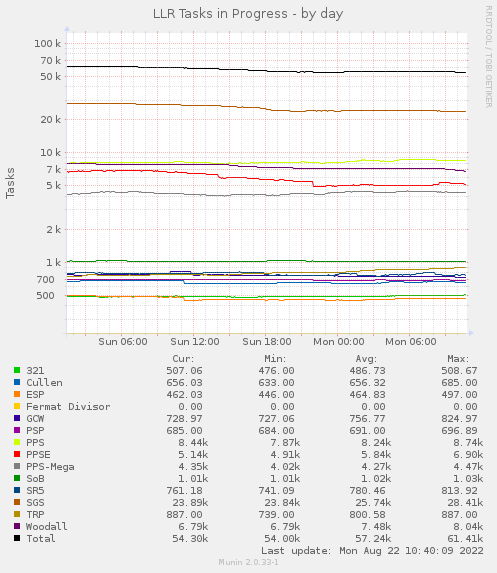 The throughput of PPS was rather uninspiring compared to the other projects I had been running. So I decided to look at how I was running PPS and did some quick testing on both my i5-4670 (DDR3-1600) and my i7-4790 (DDR3-1600). I started out with one task on four cores and was getting a lot of 1st's, but not a lot of total units done. So I tried two tasks on two cores each and found that while each unit was slower, overall throughput was higher. At that point I knew I had to try the traditional one task per core and see what happens. Then it only seemed prudent to run all three conditions on both CPUs to see if there was a difference. PPS runs remarkably similarly on the two CPUs when running one or two tasks at a time. Bump up to four tasks at a time and the i5 starts to fall off. If you have a Haswell CPU it looks like the best for speed is one task on four cores and if you want the best throughput it looks like the best is two tasks on two cores each. Running four tasks at once was all around bad on both. It had the slowest speed per unit, lowest or second lowest throughput, and had the highest CPU temperature. Different CPU families and different RAM speeds will drastically alter these results. May whoever reads this find it informative or inspiring. Message 119702 - Posted: 3 Aug 2018 | 6:28:12 UTC - in response to Message 119699. Interesting results. I should probably test same. With the caution I haven't had the 1st coffee of the day yet, for the i7 I would have expected 4 tasks (one per core) to be best throughput as the work should fit on CPU cache comfortably, thus ram speed shouldn't really matter here. I note HT is on, and unless you've forced affinity, Windows scheduler can result in about 10% performance drop when running one task per core. If you turn off HT, or manually set affinity, you might see a small boost there. When multi-thread is enabled, it works a bit differently and you don't have to worry about it then. On the i5, we're borderline running out of CPU cache, so there may be a performance impact one task per core, and thus 2 tasks of two threads each might offset that. Message 119708 - Posted: 3 Aug 2018 | 9:42:34 UTC - in response to Message 119702. With the caution I haven't had the 1st coffee of the day yet, for the i7 I would have expected 4 tasks (one per core) to be best throughput as the work should fit on CPU cache comfortably, thus ram speed shouldn't really matter here. Dunno, it just came to my mind and I felt like sharing it. Message 119709 - Posted: 3 Aug 2018 | 9:56:00 UTC - in response to Message 119702. I've left HT on for the i7 since the i7 is also my "daily driver" and the extra threads can keep the GPU fed (currently running AP) with minimal impact on the CPU tasks. Yes, AP uses very little CPU time anyway, but still it is best to minimize any impact from GPU crunching. It should also be noted that the CPU temperatures on both CPUs are lower with 2 tasks as opposed to 4 tasks at a time. And this time of year that is very important. I did pay attention to clock speeds and did not see any evidence of thermal throttling. Message 119713 - Posted: 3 Aug 2018 | 11:22:32 UTC - in response to Message 119709. You can still try setting manual affinity, but, with a GPU thrown in the mix I don't know how that would work. How much CPU time does AP take? When running multi-thread mode, it appears to set affinity in some way, so you don't need to do it manually. Interesting re temperatures. I was just going to leave mine on 1 task but will now benchmark 2 tasks to see which is cooler. Message 119717 - Posted: 3 Aug 2018 | 12:05:19 UTC - in response to Message 119716. The temperatures will of course vary with room temperature, air flow, CPU cooler quality, etc. That's why I didn't really include temperature as a key part of the test unless throttling was taking place. Looking at your systems though, Dave, I think 2 tasks at a time on your i7-2600K would probably be better than 1 task for overall performance. But test it out and see for yourself for sure. Ty Keith I'll give it a bash. Message 119725 - Posted: 3 Aug 2018 | 16:18:12 UTC - in response to Message 119720. Message 119726 - Posted: 3 Aug 2018 | 18:44:10 UTC - in response to Message 119725. And that's why you test. If 1 task 4 cores and 2 tasks 2 cores each gives the same throughput then go with the fastest run time so you have a better chance of being 1st. Just done some testing on a 6700k. As suspected, running 4x single thread tasks is maximum throughput. Using -t2 speeds things up, but you lose efficiency in the process, and only does 82% of the work compared to single thread units. Running units with 4 threads, just no. That's only 55% the throughput. Basically this doesn't seem to have changed at all from the last time I looked at it. I'd caution the difference between my testing and Keith's is that I'm NOT running any GPU tasks. Before anyone says I used Skylake and Keith was on Haswell, I don't really expect that to be significant. The i5 vs i7 difference might come into it a little though, as the smaller cache of the i5 could start to impact things. Message 119734 - Posted: 4 Aug 2018 | 13:23:56 UTC - in response to Message 119733. Don't you have DDR4 memory in the Skylake? If so, that may have a significant effect. Faster memory would give an advantage to running 4 tasks of 1 thread each. The Haswell's had DDR3-1600 memory. Message 119736 - Posted: 4 Aug 2018 | 14:12:49 UTC - in response to Message 119733. Interesting results. I expected the Skylake to beat every one of my tests. It certainly beat the quad -t1 times by a wide margin, but lost out in the single -t4. I suspect, as Michael said, that the DDR4 helped once the cache was loaded up with the four tasks. That likely explains why Skylake and newer seems to beat the 4790 by quite a wide margin on the larger tasks. The 6700K also has a very slight clock speed advantage over the 4790 at stock speeds, but I doubt that means much here. And yes, the tests I conducted were less synthetic and more "real world" as many people, myself included, will be running GPU tasks of various kinds during the challenge. On an i7, it shouldn't touch the ram even at one task per core. The work can be done out of L3 cache. Only on i5 might that become a factor. As for time differences, I'd expect it to scale with clock, plus another 14% for -lake processors compared to Haswell when not ram limited as they added something to make it go faster. The faster -t 4 result on Haswell has got my interest now... I have a Haswell quad I can excavate later and try on that. Message 119743 - Posted: 5 Aug 2018 | 17:48:19 UTC - in response to Message 119737. Haswell test is still running, but I also ran a test on my 6600k. My theory was, the the smaller L3 cache may start to hinder it. For total throughput, going one per core is still best. Like the 6700k before, running two units of two threads each was 82% the throughput. And one task of 4 threads, came out 64%, higher than on the 6700k yesterday of 55%. What is interesting is if you look at it in terms of work done. The 6600k runs at 3.6 GHz all cores, stock, compared to 4.0 GHz on the 6700k. The 6700k should be 11% faster on clock. Running 4 tasks, one per core, the 6700k was 15% faster. Running two tasks of two threads, it was similar at 14%. Maybe it is the cache in the case of 4 tasks, but it shouldn't be the case in 2 of 2, so I don't think I have a complete picture here. And the most interesting part... running one task of 4 threads, they were the same. The 6600k and 6700k both took the same median time to the second. My assumption here is that the code isn't able to scale well in that scenario, hence some limitation other than core clock dictates how fast it can go. Message 119744 - Posted: 5 Aug 2018 | 19:47:41 UTC - in response to Message 119743. Haswell results are in... and I'm not sure how to digest it. Forget comparing across architectures for now... how does it scale? Once again, running one task per core was highest throughput, with two of two close at 95%, and one task of 4 threads at 79%. The one task with 4 threads is only 2% slower than either of the Skylake results. This is suggestive of some other limit in scaling this work to 4 threads. I've previously come up with a value that Skylake is 14% faster per clock than Haswell, when not limited elsewhere e.g. ram bandwidth. Following allows for this 14% and the clock differences. Running 4x -t1, it seems to scale within expectations, within a few % or so. Running 2x -t2, I'm not sure what to do with this... it is over-performing compared to Skylake. I don't have an explanation for this. I would guess the lower running clock might be a contributing factor, and mask multi-thread scaling losses in some way, but I haven't tried to prove this or otherwise. Maybe not drastically, but yes, it will change results. As suspected, running 4x single thread tasks is maximum throughput. I tested an i7 7700K (with DDR4 3200 C14, and with a moderate negative AVX offset for the CPU clock defined in the BIOS), not only with the three configs that you chose, but with a few others more. It's an i7 after all, which has 8 logical CPUs, not 4. I came to a different conclusion than you; maybe because our systems differ, or maybe because I tested more configs. Furthermore, while I haven't investigated what the variability between currently issued PPS-LLR WUs is, I found with several other LLR subprojects in the past that the variability between WUs is greater than the throughput difference between the best and next best #tasks x #threads configuration on a given machine. This is especially true on machines with higher core count. I therefore eliminate WU variability in my own throughput tests. If you configure your machine as per test results that you read in forum posts, taking care that the tested machine and yours are similar, then you will probably get a config which is close enough to the optimum. It may be somewhat off the precise optimum though, due to hardware differences or due to imprecision of the tests. Message 119750 - Posted: 6 Aug 2018 | 14:44:41 UTC - in response to Message 119747. Care to share those results? In my experience, I've never managed to prove a case where using HT provides more throughput than not using HT. There are some cases where using HT appears to help, but they only allow you to reclaim losses from elsewhere. One example is running one per core without affinity results in around 10% throughput loss. You can regain that 10% loss by either running more tasks, or setting affinity. Using affinity is more power efficient so would be preferred, as tapping into HT also increases power usage, even if there is no performance gain. There are a number of different "k" values being tested. Even when at a similar size, it can end up working differently. I kinda brute force around it. Do a large enough sample, and take the median. Less controlled than running the same task, but I find it good enough within a couple % or so. Message 119753 - Posted: 6 Aug 2018 | 16:40:44 UTC - in response to Message 119750. I tested an i7 7700K (with DDR4 3200 C14 [...] I came to a different conclusion than you; maybe because our systems differ, or maybe because I tested more configs. Processor clock was 4.2 GHz. Operating system: Linux Mint 18.3.
which gave 159.04 credits. From a quick glance at others' hosts with PPS results, this seems to be in the middle of the range of current PPS credit/task. In my experience, I've never managed to prove a case where using HT provides more throughput than not using HT. Measurements on the hardware that I have have shown throughput gains from HT in several LLR based subprojects. But in PPS-LLR, the host with i7 7700K was the only one among the hosts which I tested which gained from HT. One example is running one per core without affinity results in around 10% throughput loss. I run PrimeGrid on Linux only. Right; I didn't explore the current range of available PPS-LLR WUs. Something I should look into in future testing. Since I run a variety of projects besides PrimeGrid, I prefer my PrimeGrid tests to take as little time as can be reasonably arranged. And if the test regime is fully reproducible, I like it even better. Message 119754 - Posted: 6 Aug 2018 | 17:17:42 UTC - in response to Message 119753. Interesting... your 4p x 1t is what I considered the optimal situation, but you got 4.4% more ppd on 4p x 2t. I don't have extensive or recent Linux experience but when I last looked at it, I think its scheduler did a better job than Windows. On that note, I had seen hints of up to 2% improvement when using HT, but I decided that wasn't significant, and even if correct wasn't enough to offset the extra power it took. I never measured that power difference, but it was 10C hotter on the core on the system I was using. That is significant. Message 119756 - Posted: 6 Aug 2018 | 18:31:20 UTC - in response to Message 119753. Message 119758 - Posted: 6 Aug 2018 | 20:35:31 UTC - in response to Message 119754. Yes, power efficiency goes down when HT is used. Message 119763 - Posted: 7 Aug 2018 | 15:03:59 UTC - in response to Message 119750. BTW, looking back at notes that I made during the SR5-LLR challenge, I saw two different FFT lengths being chosen by llr/gwnum for different WUs that I received during that challenge (probably on hosts with same hardware architecture, if not even on the same host, but my notes are not clear on that). In light of this, your suggestion to try to cover the current range of varying WUs in some way in the test setup definitely has merit. At the other end of the spectrum of test regimes, I have seen proponents of very short and quick prime95/gwnum test cases --- instead of long running llr/gwnum test cases with input from PrimeGrid --- but setting prime95 to the same FFT length as seen with PrimeGrid's WUs. I haven't looked closer into this approach yet, but I see potential for certain systematic errors in it. Message 119772 - Posted: 7 Aug 2018 | 22:42:47 UTC - in response to Message 119763. Prime95 does have a benchmark mode, and the interface in 29.x makes it easier to use than before. You can choose FFT lengths, thread and worker configurations, HT or not, and "complex FFTs". I don't know what the last one is, but I saw somewhere that might give more representative results for non-mersenne uses like LLR. I have used it to build an observation model of how hardware works under various scenarios, but for sure there will be variables I have not accounted for, so it doesn't always match "real" PrimeGrid task behavior. While I'm fairly confident in the use case on quad core, maybe 6 core consumer level Intel CPUs, I'm less sure on Ryzen (CCX, infinity fabric, exclusive cache), Skylake-X (non-inclusive mesh cache), multi-socket configuration (NUMA or not), and any other high core count system (>8 or so). As a rule of thumb, best throughput seems to be when the L3 cache (assuming inclusive) is filled but not exceeded by the running task(s). Hot in heels of completing my GCW-sieve goals, I have had a string of invalid single core SGS tasks when the number of active Ryzen cores are greater than 4. Going back in time I remember 8 core multithreaded ESP tasks that got invalidated after completing them. This was around the time LLR 8.01 was implemented. While gaming and other desktop apps I have no problem with 4 cores active and feeding 2 GPUs with PPS-sieve. I do know about Ryzens split AVX units / halved throughput. Anyway, with the upcoming challenge, Ryzen users beware. The system is a Ryzen 1700@stock 3,2 GHz with 2x8 GB 3200 MHz (XMP) CL16-18-18-38. Awaiting another sieve project patiently. Message 119807 - Posted: 9 Aug 2018 | 13:25:25 UTC - in response to Message 119795. Message 119814 - Posted: 9 Aug 2018 | 20:19:28 UTC - in response to Message 119807. I stand corrected. Dropped down to 2666MHz (offical suported speed on Taichi), worked my way up to 3066MHz, so far stable and no inconclusives. 3200 MHz gave me hardship with LLR, but worked fine with sieving. Just a side note, Asrock BIOS releases seem to be hit or miss lately, citing the PC community. I'm on 4.70. Other factors like heat are definitely not a problem. It seems running 3 tasks on 2 cores each is the sweet spot for PPS. 6 tasks on 1 core and 2 tasks on 3 cores are practically tied; 6 tasks runs a bit faster overall but 2 tasks use a little less CPU time. Message 119827 - Posted: 10 Aug 2018 | 10:50:29 UTC - in response to Message 119821. Well, i7 8700K, HT off, 4x8GB DDR4-2133. My home computer has a bit faster DDR4 and I expect a bit better times, but doing 6 tasks on 1 core is best option. Message 119828 - Posted: 10 Aug 2018 | 11:12:33 UTC - in response to Message 119827. On the last two 8700k results, if I assume the first one has HT on, it could be understandable. When running multi-thread at all, the scheduling seems to work better, but you may lose some performance from multi-thread scaling. One task per core with HT on can result in some loss of efficiency from scheduler unless you set affinity, or have HT turned off. Message 119830 - Posted: 10 Aug 2018 | 11:28:28 UTC - in response to Message 119827. Hmm. I'm also running GFN and using the computer, so it might affect my results. I need to try running some more 1-core tasks to make my results more reliable. I have 2x8GB 3200 Mhz DDR4. Message 119831 - Posted: 10 Aug 2018 | 11:56:51 UTC - in response to Message 119830. I plan to pause AP27 to make sure I get absolute most out of the machines. They will not be in significant use. So, running each task on 1 physical core is the best. Sorry for misleading :P Always doubt all results! I suppose most or all (other than myself) who are posting performance numbers here are testing with random WUs. However, nobody bothers to state their error of measurement (standard deviation for example), or alternatively how many tasks they measured and whether or not they waited for validation and normalized for credit/task. Performance reports which lack this type of data are of rather little value [edit:] because they may easily lead to wrong conclusions. When running multi-thread at all, the scheduling seems to work better, but you may lose some performance from multi-thread scaling. One task per core with HT on can result in some loss of efficiency from scheduler unless you set affinity, or have HT turned off. When you are telling people this, please don't forget to include that this only applies to Windows. Linux gets only a very small effect from this, about an order of magnitude below the error of measurement that occurs when random WUs are chosen. and now to something completly different: GO! GO! GO! Partial solar eclipses never get as much media attention (or scientific study/viewing!) as the full or annular eclipses. Does anyone live near enough to catch a view? There's also the yearly Perseid meteor showers tonight. And BOINC@MIXI had the best start! Message 119879 - Posted: 11 Aug 2018 | 17:38:38 UTC - in response to Message 119849. Message 119882 - Posted: 11 Aug 2018 | 18:31:39 UTC - in response to Message 119880. I hope we will find 4 and I'll catch one of them! Still searching for a Mega Prime!! I have not a scooby-diddly-dumplings. 1 maybe, in the last hour. Message 119888 - Posted: 11 Aug 2018 | 21:27:33 UTC - in response to Message 119880. We actually started betting on this yesterday in Discord. My vote was 5. There's 2 so far. Actually, there's one more. So there's 3 now. The current leading edge (i.e., latest work unit for which work has actually been sent out to a host) is n=2625781. The leading edge was at n=2616900 at the beginning of the challenge. Since the challenge started, the leading edge has advanced 0.34% as much as it had prior to the challenge! Message 119890 - Posted: 12 Aug 2018 | 7:45:45 UTC - in response to Message 119888. My guess of 5 may have been a bit pessimistic. EDIT: I missed one. We're up to 5. Message 119892 - Posted: 12 Aug 2018 | 13:04:48 UTC - in response to Message 119699. How do you go about changing how many tasks per core or how many cores per task (however its setup)? I'm interested because I never knew you could change those values and I have a laptop with an i7-7700hq that runs extremely slow on task when it is useing all 8 cores. Message 119894 - Posted: 12 Aug 2018 | 13:31:24 UTC - in response to Message 119892. One observation first-that is a 4 core processor, with 4 additional virtual cores (i.e. hyperthreading cores). You generally don't want to run LLR on HT cores, so either disable HT or run at most on 50% of cores. Please note, I included "max_cpu" tag lines, when those are in fact unnecessary. Message 119909 - Posted: 12 Aug 2018 | 17:54:47 UTC - in response to Message 119894. You generally don't want to run LLR on HT cores, so either disable HT or run at most on 50% of cores. This information is outdated at best and should not be perpetuated. The current leading edge (i.e., latest work unit for which work has actually been sent out to a host) is n=2630853. The leading edge was at n=2616900 at the beginning of the challenge. Since the challenge started, the leading edge has advanced 0.53% as much as it had prior to the challenge! We're up to 8 primes. Message 119913 - Posted: 12 Aug 2018 | 19:23:40 UTC - in response to Message 119892. After saving the file in the correct folder (C:\ProgramData\BOINC\projects\www.primegrid.com\ on most Windows hosts), I recommend to restart boinc-client. Different hosts definitely have other optimum settings. However, the performance delta between optimum and next best settings is usually small, hence: no worries. If that i7 7700K for which I reported throughput ran Windows instead of Linux, then the optimum might either be the same, or might be 1 thread per task, HT disabled in the BIOS, BOINC set to use 100 % CPUs, no other load on the host. I have no idea how far your laptop differs from my desktop. First of all, computational performance of laptops is nowadays limited by the heat dissipation capacity of the cooling system. Second, do you have dual channel RAM in it? Many laptops are sold with single channel RAM per default. LLR benefits from RAM bandwidth. With single channel RAM, it is again possible that the optimum is 1 thread per task, HT disabled. But this is just a wild guess on my part. Message 119920 - Posted: 13 Aug 2018 | 5:55:42 UTC - in response to Message 119913. Thank you all for the information... Probably my first time deep diving into this program so I'm very new into all of it. Message 119929 - Posted: 13 Aug 2018 | 11:53:01 UTC - in response to Message 119925. Message 119947 - Posted: 13 Aug 2018 | 17:45:39 UTC - in response to Message 119924. Bitte brecht Arbeitspakete, die ihr nicht mehr rechnen wollt, ab, anstatt sie zu pausieren oder eure Rechner abzumelden. Abbrechen ermöglicht eine sofortige Neuausgabe, so daß das Ergebnis des Wettkampfes möglichst bald verifiziert werden kann. Hope this reminder in our forums helps. The current leading edge (i.e., latest work unit for which work has actually been sent out to a host) is n=2636035. The leading edge was at n=2616900 at the beginning of the challenge. Since the challenge started, the leading edge has advanced 0.73% as much as it had prior to the challenge! 9 PPS primes were found during the challenge. All were challenge tasks. Congratulations to the Czech National Team and to zunewantan. It was a great challenge, despite the heat. Message 119952 - Posted: 13 Aug 2018 | 18:18:06 UTC - in response to Message 119950. Yes, it was a good challenge and congrats to the Czech National Team (pulled a page out of our playbook) and big congrats to zunewantan. and a double congrats to the prime finders. Aug-13: Solar Eclipse: 55801 tasks outstanding; 44514 affecting individual (293) scoring positions; 23540 affecting team (68) scoring positions. Thanks and congrats to everyone who overcame the heat to take part in this challenge! Message 119974 - Posted: 14 Aug 2018 | 13:34:49 UTC - in response to Message 119953. Aug-14: Solar Eclipse: 25191 tasks outstanding; 18643 affecting individual (278) scoring positions; 7467 affecting team (40) scoring positions. Message 119978 - Posted: 14 Aug 2018 | 14:04:19 UTC - in response to Message 119974. Still crunching here for the cleanup. Message 119979 - Posted: 14 Aug 2018 | 14:14:45 UTC - in response to Message 119978. Please understand that the majority of the cleanup (and, at this moment, "majority" means exactly 100%) involves waiting for tasks that have been sent to computers to either be completed or to time out. The tasks your computer is getting right now are not cleanup tasks. Run PPS-LLR or not, as you desire. It won't affect the cleanup either way. Message 119981 - Posted: 14 Aug 2018 | 14:20:49 UTC - in response to Message 119979. I went for CUL to test the crunch time, but forgot to change my config (it was for PPS) and BOINC downloaded 3 CUL tasks intstead of only one, as I expected. I have a personal policy and try to never abort downloaded tasks. So I'm stuck with CUL for a while. Message 119992 - Posted: 15 Aug 2018 | 10:37:06 UTC - in response to Message 119974. Aug-15: Solar Eclipse: 18195 tasks outstanding; 12107 affecting individual (256) scoring positions; 1357 affecting team (29) scoring positions. Message 119993 - Posted: 15 Aug 2018 | 10:39:14 UTC - in response to Message 119979. Ah ic, thanks for the info. Message 120011 - Posted: 16 Aug 2018 | 13:07:21 UTC - in response to Message 119992. Aug-16: Solar Eclipse: 7545 tasks outstanding; 3279 affecting individual (188) scoring positions; 172 affecting team (17) scoring positions. Aug-17: Solar Eclipse: 4290 tasks outstanding; 1269 affecting individual (125) scoring positions; 47 affecting team (7) scoring positions. Message 120035 - Posted: 18 Aug 2018 | 9:56:16 UTC - in response to Message 119949. That number is comparable to 10^(1.67 * 10^791857) or 10^(10^(10^5.8986)). Message 120036 - Posted: 18 Aug 2018 | 11:14:34 UTC - in response to Message 120011. Aug-18: Solar Eclipse: 1820 tasks outstanding; 291 affecting individual (61) scoring positions; 18 affecting team (3) scoring positions. Aug-19: Solar Eclipse: 631 tasks outstanding; 40 affecting individual (15) scoring positions; 4 affecting team (2) scoring positions. Aug-20: Solar Eclipse: 193 tasks outstanding; 7 affecting individual (4) scoring positions; 0 affecting team (0) scoring positions. ● vaughan of AMD Users for finding the prime with the lowest k of the challenge 465*2^2630496+1 that is also a Factor of xGF(2630493,7,4)!!!! See you at the Oktoberfest Challenge!